This recipe feels like a bit of a cheat really, as it’s made up and is so simple. I am all for keeping things fast and easy in the kitchen, as life is so busy at the moment. So anything that fits in with the daily routine and saves time and is healthy is a win, win, win. I never really ever follow recipes for smoothies or juices and I don’t have much time when I am working from home so this is a healthy option for me for breakfast after I’ve done the school run or for lunch. 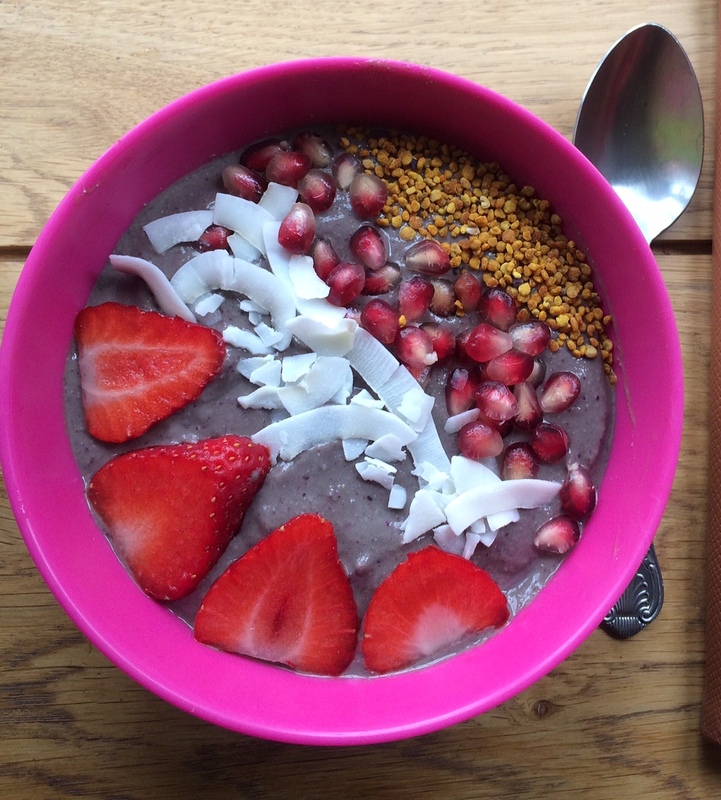 I’ve been seeing smoothie bowls on my instagram feed for a while and didn’t really get them until I made a smoothie in my NutriNinja and it was too thick so I poured it into a bowl and it was delicious – I didn’t realise how good it would taste especially with the toppings – I used fruit, coconut flakes and local bee pollen. And of course it looks so pretty and the possibilities are endless – the only limitation being your imagination and of course, your tastebuds! I will post some info about the nutrition info soon, but just need to get this posted for #WakeuptoOrganic events happening in independent retailers on 15th June. Blend together with a normal blender or high powered blender, put in bowls and decorate with toppings of your choice.